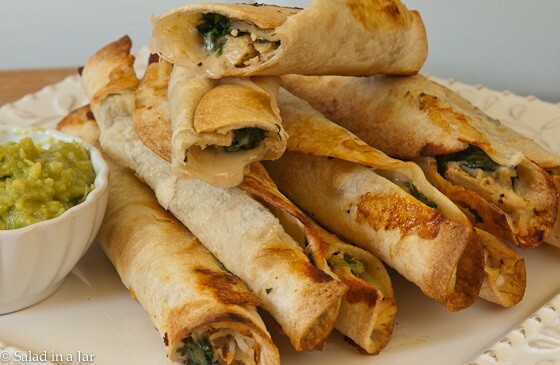 Crispy Chicken and Spinach Flautas are made with flour tortillas, rotisserie chicken, spinach and cheese. Don’t forget to serve with your favorite salsa and guacamole. We arrived home from NYC a couple days ago. In all likelihood, it was our last trip to the city that never sleeps (and where I don’t sleep much either because of the street noise), at least for a few years. Our kids, who lived there for the last three years, are moving back to our corner of Texas at the end of September. My excitement is matched only by the same feelings I had when my oldest son and his family recently moved to a house only about 5 minutes from ours. Mimi and Papa are in grandparent heaven! Meanwhile, I’ve been trying to work off the damage done by the fabulous Chocolate Chip Walnut Cookies and the Oatmeal Raisin cookies we always pick up from Levain’s Bakery on our way out of town. Have you tried them? To begin with, they are huge. But they are also buttery, chewy, and downright addictive. Thankfully, they cost a lot. $4 a piece tames the temptation. So…..no more sweets for awhile. 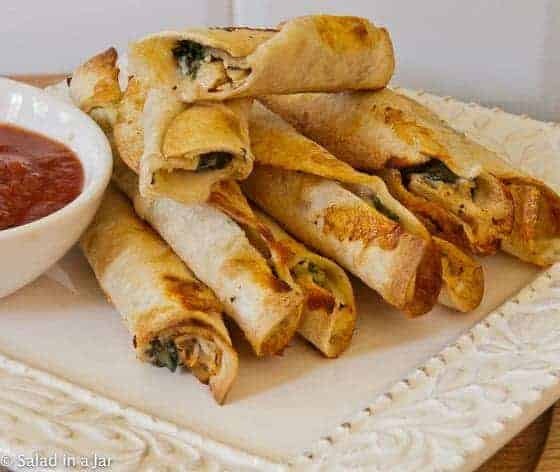 I’m sure it won’t last, but here’s a recipe that’s so easy and tasty, I usually have no room for dessert when I’ve had my fill of these Crispy Chicken and Spinach Flautas. It’s similar to the Crispy Egg and Sausage Breakfast Flautas I wrote about here. Start with my favorite TortillaLand uncooked flour tortillas (available dependably at Costco and other grocery stores, not so dependably.) I like the TortillaLand tortillas because of the way they bake up flaky and crispy. 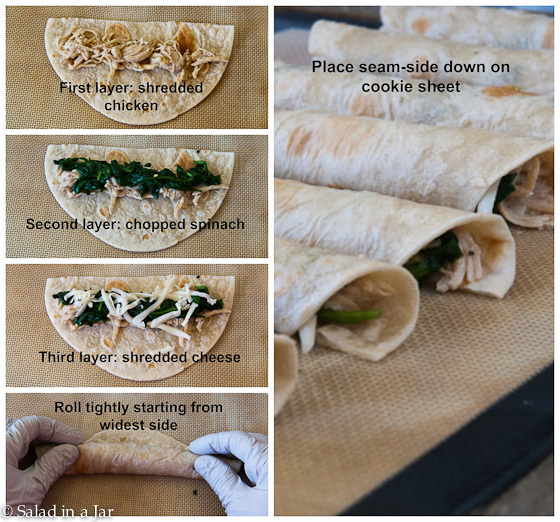 Stuff the tortillas with shredded rotisserie chicken, fresh sauteed spinach, and your choice of cheese. I prefer Pepper Jack cheese for the heat and flavor it adds. Monterey Jack would be a milder choice. Cheddar cheese also works. Make some fresh guacamole or use salsa as a dip for your flautas. They aren’t the same without condiments. By the way, I recently discovered I peel avocados all wrong. Check it out here. Crispy Chicken and Spinach Flautas are made with flour tortillas, rotisserie chicken, spinach and cheese. If you are using uncooked tortillas, go ahead and cook them per directions on the package. Otherwise, cut cooked flour tortillas in half. 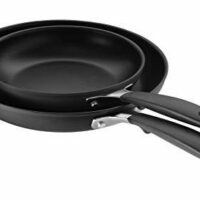 Place fresh spinach into hot skillet and heat just until wilted. Drain any excess liquid. Distribute equal amounts of chicken, spinach, and shredded cheese onto long side of each tortilla half. See picture above. Starting with the long side, tightly roll each tortilla and place onto cookie sheet seam-side down. The cheese will melt and stick, so I recommend lining cookie sheet with non-stick aluminum foil, parchment paper, or a silicone baking mat for easy removal of the flautas and quick clean-up. Spray both sides of rolled tortillas with olive oil or coconut oil. Bake at 450 degrees for 8 minutes or until flautas start to brown. Carefully flip flautas to seam-side up and continue to bake for another 5-8 minutes until flautas are golden brown and crispy all over. If seams start to pop open after you flip flautas, gently press them back together with your tongs while flipping. I know how I am cutting avocados going forward! Who knew? Plus, these flautas look terrific, I’m always looking for more ideas for those Costco roast chickens.